Albert Franklin Harbaugh was born on Sept. 26, 1853, on a farm at what is now Clairton Lake near Scullton, Somerset County, PA, the eldest son of David and Mary Magdalene (Whipkey) Harbaugh. Albert's life story is largely a mystery. A grand-nephew once stated that Albert left home as a teenager after a heated dispute with his father over a horse. He may have changed his name once he arrived in the West. Never married... Albert spent part of his life in Arizona, then Walla Walla, Wash., and was last heard of in Republic, Wash.
A rare old postcard view of Walla Walla is seen here, showing what the town looked like in the early 1900s. Thanks to research done by cousin Robert Kellner, Albert has been located in the federal census of 1900. He was listed under his Christian name, and was residing in South Milton Precinct, Umatilla County, OR. He was working as a farm laborer. Unfortunately, he has not yet been found in the federal censuses of 1880 or 1910. 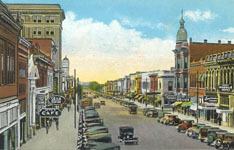 Albert passed away at the age of 80 on Jan. 19, 1934, in Spangle, Spokane County, WA. His burial site is not yet known, but will be reported here when learned.